All You Need To Pass Your General Class Exam! Pass the 35-question General Class test. All the Exam Questions with Answer Key, for use through June 30, 2019. Use with ARRL’s online Exam Review for Ham Radio (instructions are included inside the manual). Detailed explanations for all questions, including FCC rules. The General Class license is the second of three US Amateur Radio licenses. To upgrade to General Class, you must already hold a Technician Class license (or have recently passed the Technician license exam). Upgrading to a General license--which conveys extensive HF privileges—only requires passing a written examination. Once you do, the entire range of operating modes and the majority of the amateur spectrum below 30 MHz become available to you. NEW! Online Review and Practice Exams As you complete each chapter of this book, use ARRL’s online Exam Review for Ham Radio to help prepare you for exam day. This web-based service uses the question pool to construct chapter-by-chapter reviews. Once you’ve finished this book, use the online service to take practice exams with the same number and variety of questions that you’ll encounter on exam day. You won’t have any surprises on exam day! 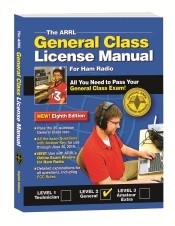 The ARRL General Class License Manual. Kindle Edition. ARRL's General Q & A. Includes the question pool with brief explanations.